When the cold winter months roll around, you need to provide your outside dog with the protection they need to stay safe, comfortable, and healthy.If you live in a colder climate, your dog is at risk of hypothermia, frostbite, and much more. While summer dog houses can help to keep the sun at bay, they aren't built to protect your dog from the harsh winds and snow of winter. Luckily, there are ways to keep your dog warm. You can make some changes to their existing dog house or invest in numerous products that work to create a warmer environment inside. With a bit of extra planning, your dog will have no problem curling up in their home in the dead of winter for a warm and cozy night. A high-quality dog house built for the rigors of winter is the first step to keeping your dog safe. 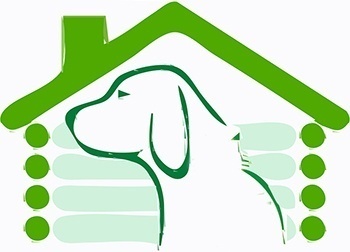 There are many great dog houses available on the market to choose from. Alternatively, you can build your own dog house from the ground up to ensure that they have all the comforts of home. Whether you're building or buying, weatherproof houses have a number of features you need to look out for. Some of the best dog houses are built from wood or heavy-duty plastic. Plastic houses are quite affordable and capable of lasting for many years to come. They're versatile enough to protect your dog from winter winds and the heat of summer. Many are also built from a single piece of molded plastic so there are not multiple parts to worry about. Wooden houses are great if they're built to standard. Wood is versatile material that's used in your home, so why not built your dog a house out of one as well? If you're building a wooden home, make sure to provide ample protection on the roof with traditional asphalt shingles. You can also utilize vinyl siding to add another barrier against the cold and ensure that the house lasts for years to come. 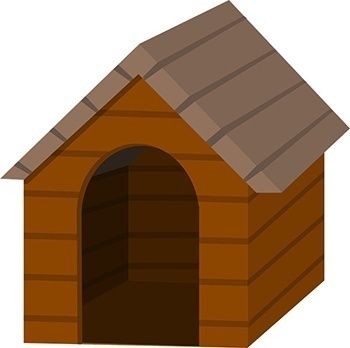 It's not uncommon to see dog houses without doors. However, it's imperative that you install one for the winter months. A big open hole just makes it easier for the cold air to get in. Even something as simple as a vinyl flap or carpet piece will make all the difference. The door should be thick and solid enough to block the cold air from entering the home but easy enough for your dog to operate. You should provide your canine companion's home with proper insulation. Whether you choose rolls of fiberglass, foam board, or loose fill insulation, it's better than not having any at all. Insulation works to keep heat in and cold out. You should insulate the floor, walls, and ceiling for maximum protection. Other ways to insulate the house include applying weather sealant and crack filler. Use a high-quality exterior filler to close gaps in the material and prevent cool air from leaking in. You can also utilize a silicone weather sealant to fill gaps around the door. While many view concrete flooring as the most durable option, it doesn't do well during the winter months. Cool air flows down into the concrete floor, making it colder than the air around. Instead of a solid floor, elevate the dog house by 6 inches or so. If you're building a house, you can use concrete fittings to provide adequate space underneath the home. If you have an existing house, place it on some concrete blocks or a wooden palette. For extra protection from cold drafts, place some insulation or straw underneath. The exact size a dog house needs will depend entirely on the size of your dog. It should have enough room to allow your dog to stand up, turn around, and lay down comfortably. With that being said, more space is not better. Your dog's body heat will naturally warm the house up a bit. If there's too much room, that body heat will fail to keep things warm. If you have an existing house with too much room, you can simply section it off for sleeping. Add a wall and a weatherproof vinyl flat. Place your dog's bedding inside this closed-off room and it'll become their space to sleep. One great way to keep your dog warm is by utilizing wasted heat from your own home. If the dog house is located near your home, you can use a simple dryer hose. First, cut a piece of plywood the same size as an open window that's nearest to the dog house. Then, cut a circular hole that's the same size as the opening of the dryer hose. Typically, hoses are 4 inches in diameter. Also cut a hole in the roof of the doghouse. Then, place the plywood in the window and connect the hose from the hole to the roof of the doghouse. You can use weather sealant around the hole openings and window to keep both homes insulated. You can point a small fan into the hose opening in your home to drive the air over to your dog's house. 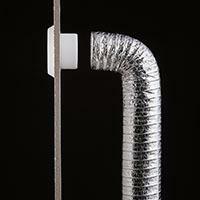 It's also recommended that you use duct flaps to prevent pests from getting into the house. Heater boxes can be used to raise the temperature inside a dog house. They're specifically made for dogs, so they often include a number of safety features. They're mounted on the roof the house and out of the way. No sleeping space is lost. They can utilize a heating light bulb or ceramic element inside. They're quick to install and very easy to maintain. This simple heater utilizes a long-lasting heating element. It's capable of heating up to 32 cubic square feet. The exterior is made from powder-coated steel. It protects your dog from accidental burns from the element. For added protection, the cord features a stainless steel cord cover. It's chew-proof and runs the entire length of the cord. There's also a tension relief built in to prevent your dog from accidentally pulling the plug out. 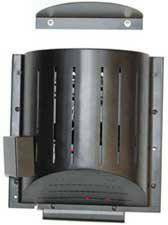 Another great product from Akoma, this heater features a sleek black appearance. The thick steel exterior keeps your pooch protected from burns while allowing heat to spread throughout the house. There are no sharp edges. Instead, the shape of the unit is curved. It has an internal heat shield and a grounded cord with steel spiral protection. 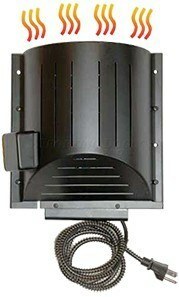 A mounting bracket is included for easy installation. 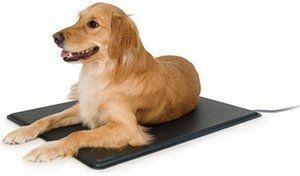 A heating mat, also known as a kennel mat, can provide heat for your dog much like a heating box. It's a large pad that has built-in heating elements inside. When plugged in, heat builds up and spreads throughout the dog house to increase the overall temperature. They're very versatile and can be placed underneath your dog's bed, on the wall, or underneath the entire house. This pad is built to be used outside and features heavy-duty components for durability. It's thermostatically controlled for precision. The mat is available in a few different sizes, the largest measuring 22.5 inches by 28.5 inches. The pad itself is made from a thick ABS plastic. It's resistant to chewing and can hold up well in tough conditions. A 5-foot cord is included. It's wrapped with stainless steel to prevent damage from chewing. While most dog house heaters and mats are built with safety in mind, you can never be so sure with a determined dog. It's a good idea to keep cords away from your dog. You can block access by covering it in a chew-proof material, placing it in a tube, or by drilling a hole in the house so that your dog doesn't even see it. There are a number of great insulating beds available. They use thick foam that's designed to trap warm air. As your dog lays on the bed, their body heat stays behind. They can get up and return to a cozy spot. If you'd rather make a bed, straw is a great insulating product. You can place it inside a soft fabric casing or place it directly on the floor of the house. 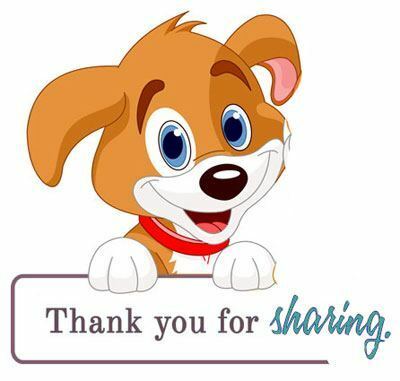 Either way, your dog will appreciate it. If you're worried about running wires from your house to the dog house, utilize solar power. It can save on energy costs while giving your dog all the power he needs to stay warm. You'd only need a small array for a dog house. Smaller systems are relatively cheap and easy to install by yourself. Simply place the panels on the roof, attach the inverter to the back of the house out of harm's way, and plug in your heaters. You can also use solar panels without the inverter to take advantage of a green house effect. During the day, the sun will enter the dog house to raise the temperature. It'll stay relatively warm after the sun goes down. Placement of the dog house can make a big difference. It's a good idea to place the house as close to your home as possible. This will help keep the home blocked from winds. The opening should be positioned away from the direction of the wind. While it's a minor change, it can make a huge difference to the overall comfort and safety of your dog.